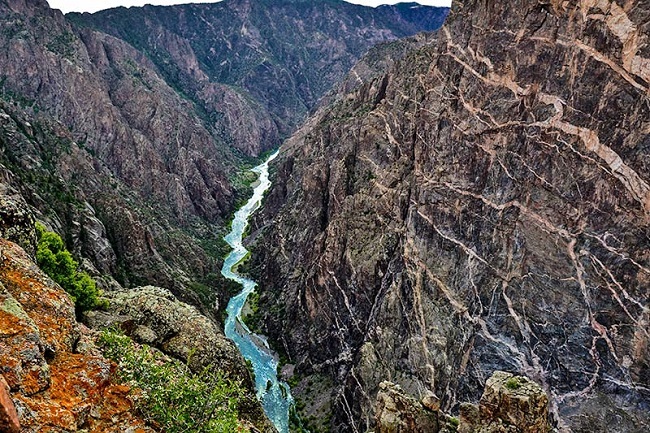 Welcome to the Black Canyon of the Gunnison National Park Information Page. Learn about the geology, trees, mammals, birds, or other plants and wildlife of the area.The Black Canyon hosts a variety of ecosystems from pinyon pine, juniper and scrub oak forests at the rim, to the shady and vertical inner canyon walls, and down to the riparian community along the Gunnison River. Canyons aren’t barriers to birds. In search of food and water, birds can readily fly to depths and heights forbidding for other animals, including humans. Common birds in the park include the Great Horned Owl, Mountain Bluebird, Stellar’s Jay, Peregrine Falcon, White-Throated Swift, Canyon Wren, Black-billed Magpie, Black-headed Grosbeak, Black-throated Gray Warbler, Blue-gray Gnatcatcher, Cliff Swallow, Common Nighthawk, Common Raven, Dusky Flycatcher, Green-tailed Towhee, House Wren, Northern Flicker, Orange-crowned Warbler, Mourning Dove, Plumbeous Vireo, Rock Wren, Spotted Towhee, Virginia’s Warbler, Yellow Warbler, Western Tanager, Warbling Vireo, and American Dipper. By far one of the most elegant and visible animals is the mule deer. Mule deer are amazing animals. They have adapted to many different types of habitats and seem to thrive in all of them. As you look into the depths of the canyon it may be hard to believe that these animals are just as at home trekking to the canyon bottom as they are meandering the oak flats on the rims. Even so, Black Canyon is often not an easy place for them to be. Other mammals you might see living in the park include the American Beaver, Big Brown Bat, Bighorn Sheep, Coyote, Deer Mouse, Hopi Chipmunk, North American Porcupine, elk, and Striped Skunk. South Rim: Open every day. The South Rim Road is open to vehicles from early April to mid-November. In winter, the South Rim Road is open to Gunnison Point. The remainder of the road is closed to vehicles, but open to cross country skiing and snowshoeing. North Rim: North Rim Road and ranger station are closed in winter. The road typically closes late November and reopens mid-April. North Rim Ranger Station is open intermittently during the summer and closed the rest of the year. SOUTH RIM VISITOR CENTER is open year-round. Location: Two miles from the south rim entrance station on the South Rim Road. Entrance fees are $15.00 per vehicle at the South Rim entrance station and the North Rim ranger station of Black Canyon. It covers all persons in a single, private, noncommercial vehicle and is valid for seven calendar days. The entry fee for pedestrians, bicyclists, motorcycles, motor scooters, or mopeds is $7.00 per person, not to exceed $14.00 per vehicle. There is no fee charged for persons 16 years of age or younger. Pets on a leash may be walked on roads, in campgrounds, to the overlooks, and are allowed on the Rim Rock Trail, Cedar Point Nature Trail, and North Rim Chasm View Nature Trail. Pets are not allowed on any other hiking trails, inner canyon routes or in the wilderness area. Owners are responsible for their pet’s behavior and may receive fines if their animal creates problems with wildlife and/or other visitors. Do not leave your pet unattended in a vehicle or campsite. Interior temperatures of vehicles rise within minutes and pets can quickly overheat and die, even with the windows cracked. Weather can vary greatly between the canyon rim and canyon floor. Summer daytime temperatures range between 60 to 100F (15 to 38C), nights 30 to 50F (-1 to 10C). Winter daytime temperatures range between 20 to 40F (-6 to 4C), nights -10 to 20F (-23 to -6C). Precipitation is minimal, brief afternoon thunderstorms can occur during the summer. Layered clothing appropriate for the season is recommended.